textobj-rubyblock : A custom text object for selecting ruby blocks. A custom text object for selecting ruby blocks. 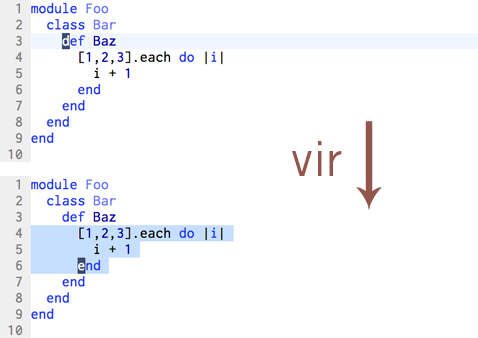 Also requires that matchit.vim vimscript #39 is enabled. so with the `o` key. way if you prefix a count. 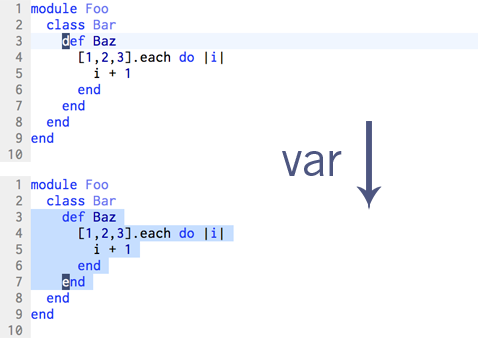 This is due to a limitation in vimscript #2100.
selection inwards by repeating `ir`. this plugin will not work. textobj-rubyblock.vba 0.0.2 2010-12-29 7.2 Drew Neil Do not be fooled by postfix conditionals.